A prolific draughtsman, Roseman employs a variety of drawing materials with great versatility. 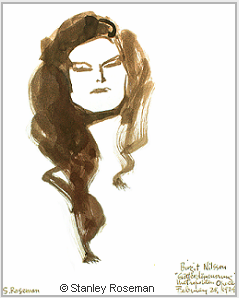 Here, the artist drew the portrait of Birgit Nilsson with brush, bistre ink, and wash. Roseman delineates with the tip of his brush the dramatic soprano's distinctive, facial features; calligraphic brushstrokes render her flowing, brown hair. The immediacy of expression in the drawing goes beyond the theatrical personage on stage to reveal the individual. During five years at the Metropolitan Opera, Roseman drew the Swedish soprano in her acclaimed role as Brünnhilde in Wagner's Götterdämmerung, (fig. 4). The Met's production of Götterdämmerung in the 1973-74 season completed the Der Ring des Nibelungen cycle for the first presentations of the Ring at the new Metropolitan Opera House, Lincoln Center. The Bibliothèque Nationale de France acquired in 1982 a suite of Roseman's drawings from the Metropolitan Opera, New York City Opera, and the Bolshoi Opera's American premiere. Two of the artist's splendid drawings are from the Bolshoi Opera's famous production of Mussorgsky's Boris Godunov, based on the tragedy by Pushkin. 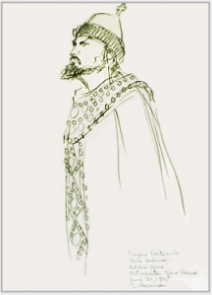 Depicting Nesterenko as Boris Godunov, Roseman draws with strong, dark, pencil strokes to express physiognomy and heighten the dramatic intensity of the commanding, bearded Tsar seen here in three-quarter profile and wearing an elaborately jewelled robe and fur-trimmed crown surmounted by a cross. The Bolshoi Opera drawings depict bass Yevgeni Nesterenko in the title role as the tormented Tsar, (fig. 5), and tenor Georgi Andriushchenko as the sly Prince Shuisky, a long-bearded figure clothed in a fur-collared overcoat. MUSIC has been an important part of Roseman's work from the outset of his career in New York in the early 1970's. In his youth, Roseman enjoyed a close relationship with his father, who greatly encouraged his young son's natural talents in art and desire to become an artist. Bernard Roseman, an avid opera-, theater-, and concert-goer took his son to the opera; theatre, including Broadway musicals; and ballet and modern dance, as well as to concerts - exciting worlds that were to inspire the artist in the creation of his paintings and drawings. The gala occasion of the return of Vladimir Horowitz to the concert stage in January 1978 after an absence of twenty-five years was a momentous event in the music world. "Horowitz played Rachmaninoff's Piano Concerto No. 3 accompanied by the New York Philharmonic conducted by Eugene Ormandy. Horowitz had a unique association with that celebrated, piano concerto as the composer himself had praised the pianist's brilliant interpretation. "Vladimir Horowitz was a most wonderful subject to draw - a tall, striking figure with distinctive, facial features underscored by his signature bow tie, which he always wore for his appearances on stage. Time Magazine published the drawing presented below, (fig. 3), from Roseman's suite of drawings of Horowitz in concert at Carnegie Hall. Rarely had Time published a drawing in place of a photograph for the Magazine's coverage of important news events. 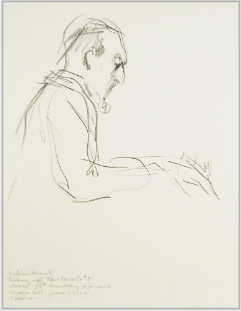 An intense concentration is seen on the pianist's face rendered in subtle tones of the graphite pencil. In this impressive drawing, Horowitz sits with his torso erect, his arms and hands forming the base to the pyramidal composition, the pianist's fingers moving in delicate flight over the keyboard. Time Magazine placed the Roseman drawing at the top of the page with the caption "Drawing of Horowitz playing at Carnegie Hall'' and the credit "Drawing by Stanley Roseman.'' 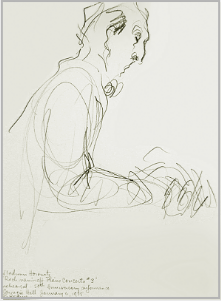 The drawing was the only picture of the pianist at the keyboard in the Time reportage. An accompanying black and white photograph shows Horowitz and Ormandy standing together and sharing a bow with members of the New York Philharmonic. 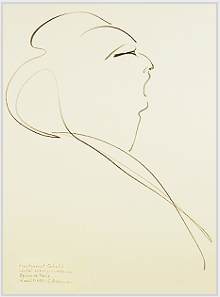 Roseman's portraits of prominent personalities in the field of music include the eminent Pulitzer Prize winning American composer Virgil Thomson, who sat for the artist at the composer's apartment in the landmark Chelsea Hotel in New York City in 1972. Thomson requested that the portrait be exhibited at Carnegie Hall on the occasion of his eightieth birthday and the New York premiere on December 26, 1976 of his Symphony No. 3, performed by the American Symphony Orchestra, whose press release praises the portrait as "a magnificent painting of the composer." The portrait of Virgil Thomson is featured on the website page "Biography," Page 7 - "Portraits," along with excerpts from the artist's journal in which he recounts painting the composer's portrait. The prestigious Royal Academy of Music, Stockholm, founded in 1771, conserves Roseman's "fine portrait of Birgit Nilsson,'' revered as the greatest Wagnerian soprano of her time. Roseman began an extensive work on the performing arts in 1972 with a gracious invitation from Francis Robinson, the Assistant General Manager of the Metropolitan Opera, Lincoln Center, New York City. The portrait Birgit Nilsson was included in the American bicentennial exhibition Stanley Roseman - The Performing Arts in America, which comprised the artist's work from opera, theatre, dance, and the circus. The exhibition, produced by Ronald Davis, toured the United States from December 1975 through 1976 and concluded at the Library and Museum for the Performing Arts, Lincoln Center, winter-spring 1977. Following the exhibition, the Nilsson portrait entered the collection of the Royal Academy of Music. famous Swedish artists and personalities in the field of music. . . .
Having began drawing at the Metropolitan Opera in 1972, Roseman was invited that same year to draw at the New York City Opera and the following year, at the Lyric Opera of Chicago. His ongoing work at the opera included an equally gracious invitation from the Bolshoi Opera on the historic occasion of the company's American premiere in 1975 at the Metropolitan Opera House. A selection of drawings on opera are presented on the website Page 2 - "World of Shakespeare," and Page 3 - "The Performing Arts in America Exhibition." 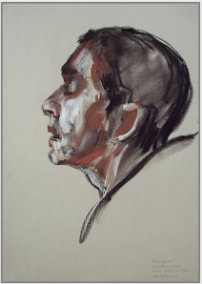 Roseman drew at dress rehearsals and performances from the front of the auditorium and from the wings of the stage and had the wonderful opportunity to create drawings of celebrated singers of different nationalities in diverse and exciting opera repertories. Music is integral to monastic life from the ancient observance of chanting the Psalms at the Divine Office. Roseman's studies of monasticism led him to write a text on monastic life and his work in the monasteries to accompany his paintings and drawings. In his text the artist cites monastic contributions in the development of Western civilization. Roseman drew monks and nuns in choir singing the Psalms as well as members of a community playing musical instruments. 1. Igor Stravinsky, An Autobiography, (London: Calder & Boyars, 1975), pp. 26, 96, 98. 2. Stanley Roseman, Stanley Roseman and the Dance - Drawings from the Paris Opéra, (Paris: Ronald Davis, 1996), p. 16. 3. 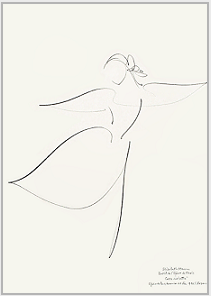 Stanley Roseman - Dessins sur la Danse à l'Opéra de Paris (text French and English), (Paris: Bibliothèque Nationale de France, 1996), p. 11. 4. Yehudi Menuhin, Unfinished Journey, (London: Futura Publications Ltd., 1978), p. 222. 6. New Oxford History of Music - Early Medieval Music up to 1300, (Oxford: Oxford University Press, 1978), pp. 279, 291. In this portrait drawing skillfully rendered with luminous highlights and warm shading, Roseman conveys a spiritual intensity on the face of the young, Spanish monk seen here in profile, his head uplifted and eyes closed as he sings the Psalms. (See page "Monastic Journey Continued," Page 8 - "Monasteries in Old Castile." In 1993, when Roseman was drawing the dance at the Paris Opéra, two celebrated musicians gave concerts on the illustrious stage of the Palais Garnier: Montserrat Caballé in a recital in April to benefit UNESCO's World Foundation for Research and Prevention of AIDS and Yehudi Menuhin conducting the Philharmonia Hungarica Orchestra in a concert in October to benefit underprivileged children. Roseman's work from his sojourns with the famous American Ringling Bros. and Barnum & Bailey Circus in the 1970's and early 80's and his return to the subject of the clown in Paris in the 1990's includes depictions of clowns at their music, for clowns and music have a long association in the theater and the circus. 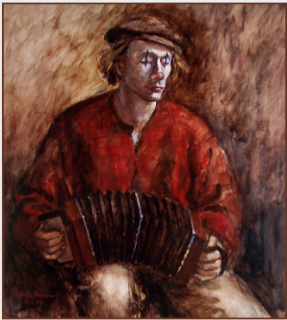 The French clown Christophe in the painting Reverie - Christophe Playing the Accordion, 1995, (fig. 8), was one of the talented clowns whom Roseman drew at the Ranelagh Theatre's production of Sur la route de Sienne, a fanciful, pantomimic adaptation of Shakespeare's Romeo and Juliet with the music of Prokofiev and Nino Rota. Over several evenings after performances, Christophe generously gave of his time to sit for Roseman in his studio. In this magnificent painting the clown wears white-face makeup; a voluminous, burgundy shirt; beige trousers; and a French cap called a gavroche. A quality of moonlight illuminates the painting imbued with earth colors of umber and sienna. The artist's chiaroscuro modeling renders the young man's face half in light and half in shadow in this nocturnal composition. Here the viewer participates in the clown's reverie as he sits with eyes closed, absorbed in his music. Music is a stimulating force for the dancer and was so for Roseman drawing dancers in Romantic and classical ballets and a comprehensive range of modern dance. During the 1970's in New York City, Roseman was cordially invited to draw at the American Ballet Theatre, New York City Ballet, Martha Graham Dance Company, Dance Theatre of Harlem, Belgium's Béjart Ballet of the XXth Century, National Ballet of Canada, and Britain's Royal Ballet. In 1989, with a prestigious invitation from the Paris Opéra, Roseman took up his paper and pencils again to create an extensive oeuvre on the dance. The music to which Roseman drew the dance spans the centuries - from Henry Purcell's suite Abdelazer, 1695, and utilized by José Limón for his modern dance The Moor's Pavanne, based on Shakespeare's Othello, (See "Biography,'' Page 2 - ''World of Shakespeare. ''), to Thom Willems' score with synthesizer and percussion for William Forsythe's non-narrative In the Middle, Somewhat Elevated, choreographed in 1987 for the dancers of the Paris Opéra Ballet, and seen here with the drawing of star dancer Wilfried Romoli, (fig. 6). Christophe had studied science and music, but his interests in the circus led him to circus schools in Paris and Grenoble, where he trained as an acrobat, juggler, and clown. In a tour de force of draughtsmanship and with a minimum of swift strokes of the pencil, Roseman creates an electrifying image of the male dancer. 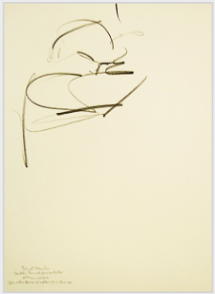 A selection of Roseman's drawings on the dance is also presented on "Biography,'' Page 3 - "The Performing Arts in America Exhibition'' and Page 6 - "Drawings from the Paris Opéra.'' To cite here: From the Graphische Sammlung Albertina, Vienna, is the drawing of Mikhail Baryshnikov as Duke Albrecht in the American Ballet Theatre's 1975 production of the great Romantic ballet Giselle, whose memorable score by the French composer Adolphe Adam was innovative in the use of leitmotif to establish musical character identity in ballet. At the Paris Opéra, Bach's Magnificat was utilized by John Neumeier for his ballet by the same name, represented by the drawing in the Musée d'Art Moderne et Contemporain, Strasbourg, of Nicolas Le Riche taking a thrilling leap. Stravinsky's The Rite of Spring is represented by the drawing in the Bibliothèque Nationale de France of Marie-Claude Pietragalla as the sacrificial maiden in the climax of that iconic work of modern dance. Between the years 1875 and 1891, Tchaikovsky composed Swan Lake, The Sleeping Beauty, and The Nutcracker. At the Paris Opéra, Roseman drew at performances of all three Tchaikovsky ballets. From Santo Domingo de Silos, in Castile, a Benedictine abbey known for the study and preservation of Gregorian chant, is the compelling portrait Fray Javier singing the Psalms, (fig. 12). Gregorian chant, associated with singing the Psalms, developed mainly in the monasteries, with the golden age of composition dating from the fifth to eighth centuries. On Christmas Eve 1996, Roseman drew from the wings of the stage Elisabeth Maurin in her acclaimed role as the dreamy, young Clara in The Nutcracker, the story of which takes place on Christmas Eve - albeit in the previous century. Elisabeth Maurin was promoted to the rank of étoile, or star dancer, in 1988 by Rudolf Nureyev in his tenure as Director of the Dance at the Paris Opéra. The Uffizi, Florence, conserves the drawing Elisabeth Maurin presented here, (fig. 7). In this sublime drawing, Roseman expresses with an economy of fluent, nuanced, pencil lines the youthfulness and innocence of Tchaikovsky's charming heroine and the grace and virtuosity of the celebrated star dancer. The acquisition by the Uffizi for its celebrated collection of master drawings includes a suite of Roseman's drawings from the Paris Opéra. 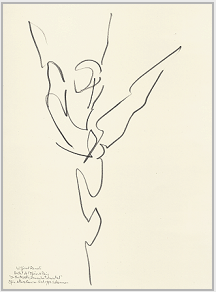 The document of acquisition from the Ministry of Culture enumerates ''four drawings by Stanley Roseman inspired by the dance'' and states that the works ''will enrich the collection of the Gabinetto Disegni e Stampe degli Uffizi." From the wings of the stage of the Paris Opéra, Roseman created superb drawings of Yehudi Menuhin conducting Haydn's Le Miracle Symphony, Mozart's Piano Concerto No.23, and Bartók's Concerto for Orchestra, composed in New York. Roseman had drawn Montserrat Caballé in the Metropolitan Opera's first staged production of Verdi's I Vespri Siciliani in 1974. A drawing of Caballé in I Vespri Siciliani was included in Roseman's exhibition The Performing Arts in America. (See "Biography" Page 3.) In 1976, Roseman drew from the wings of the Metropolitan Opera stage Caballé in Bellini's Norma. 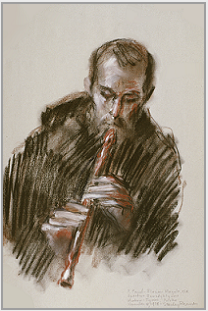 Roseman was grateful to have the opportunity in 1993 to draw Caballé on the occasion of her sixtieth birthday and her recital at the Paris Opéra. Caballé sang arias by Handel, Gounod, and Rossini; by Spanish composers Chapí, Granados, Turina, and encores with arias by Verdi and Puccini. In the splendid drawing presented here, (fig. 9), Roseman's purity of fluent, nuanced lines express in pictorial terms the mellifluous voice of the great lyric soprano. Menuhin writes in his autobiography of Bartók's interest in "the rhythms and tunes of that American-African-European synthesis which is jazz" and that the composer "incorporated some of what he heard into his Concerto for Orchestra.'' Menuhin, who commissioned the composer to write a sonata for solo violin, remained throughout his distinguished career a great advocate of Bartók's music. "Horowitz performed the piano concerto at his graduation from the Kiev Conservatory in 1919, and he made the world-premiere recording of the work in 1930, as well as in subsequent recordings. Horowitz's reprise of Rachmaninoff's Piano Concerto No. 3 at Carnegie Hall - some fifty years after the pianist's American debut there - generated excitement anew." In the impressive drawing of Menuhin, (fig. 10), Roseman places the figure high on the page in a bold use of pictorial space that gives one the impression of looking up at the conductor on a podium in front of the orchestra. Roseman's vigorous, sure strokes of the pencil express the energy and emotion of Menuhin conducting.